Crazy for First Grade: The Sweetest Centers!! Hey Friends! I have something sweet to share with all of you!!! 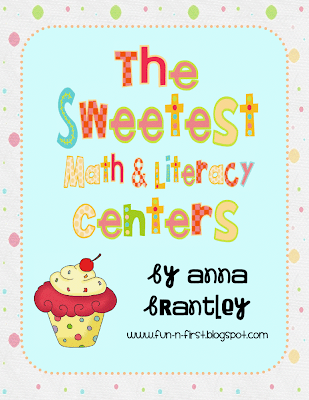 I just posted a new center/work station packet on TpT~The Sweetest Math and Literacy Centers. It includes 10 hands-on, fun activities loaded with cookies, cupcakes, ice cream, candy, and more!! There is nothing like sweet treats to get your students engaged and excited about learning!! 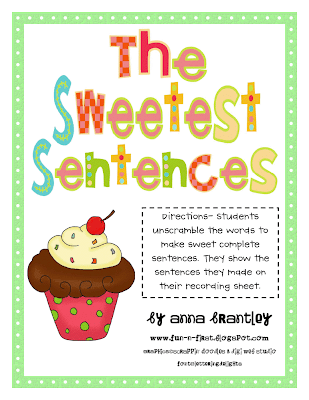 I'm planning to use this packet with my "First Grade is Sweet" theme!!! Can't wait!! Click on the picture to check it out at my lil' TpT store!! Here is a litte taste of the goodies included in the download!!! It's packed full of yummy fun!!! Of course, I want to treat all of you with a sweet FREEBIE!! Click on the picture to download The Sweetest Sentences! 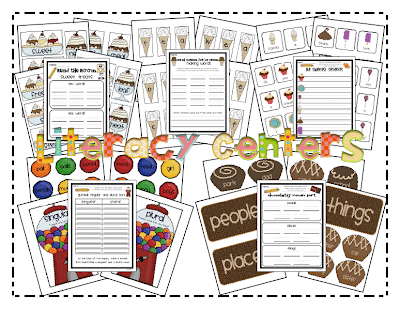 In this literacy center, your kiddos unscramble the words to make complete sentences! Before I go, I just want to say THANK YOU to everyone who stops by to check out my blog !! I'm soooooo excited to be close to 500 followers!!! HOLY MOLY!!! Y'all are THE best!!! I feel so blessed to be a part of such an amazing group of teachers!! So cute!! What program do you use to display your centers like that (all stacked)? What a great way to display it! Thanks so much, Crystal! I just insert pics of the center pages in a word document. Just started trying this preview style out...glad to hear some positive feedback on it!! 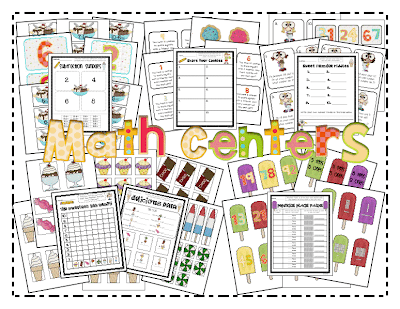 I am really excited to use this center in the fall and love your math labels too. Thank you so much for offering the giveaway too! I just created a similar sentence scramble activity (my students love them) and linked back to here when I posted about it!! I love this activity. Your are just too creative! Super cute! Thanks for sharing. Mrs.Mc- Thanks so much for letting people know about my freebie on your blog! You are too sweet!!! I know i am many years passed this being created, but when i click on the freebie it says "no preview available"...are there any solutions to this problem to download it?